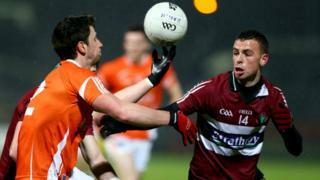 Gavin McParland hits 2-4 as Armagh defeat St Mary's 2-11 to 0-14 in the Dr McKenna Cup while Down edge out Ulster University 1-13 to 1-7. Armagh's win moved them on to four points from their three games but must now wait on Sunday's remain group fixtures to see whether they have done enough to qualify for the semi-finals. Down's win moved them to four points from their three games and to the top of Section A. However, Down also must wait to see whether they have progressed to the last four with Cavan facing Monaghan in the concluding Section A game on Sunday.